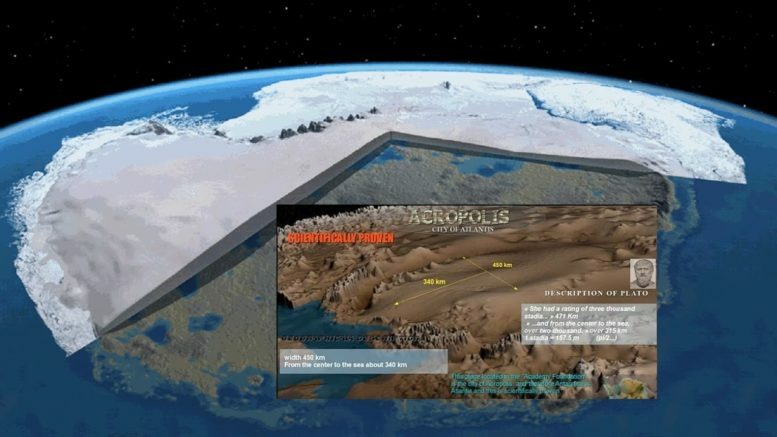 Home Mysterious Past	Frozen Antarctica is hiding the heritage of the lost continent Atlantis? What are the odds that the lost civilization of Atlantis is buried underneath the Antarctica’s ice? Generally speaking, Antarctica and Atlantis are connected in many mysterious ways. People believe that Atlantis existed sometimes in the past and its location was on Antarctica. The first masterpiece writer who mentioned the lost continent of Atlantis on paper was Plato, even though before him, many Native Americans had suspicions about it. The stories and tales of the primitive Americans have different origins and yet they share resemblance in terms of the civilization that vanished but lived in the past. In Central America, the ancient culture that talked about this civilization lived in Aztlan. Myths say Aztlan, belonged to the south, on an island and ceased with no alert due to the devastating natural occurring. The Aztlan place was described as the “place of whiteness” and that feature explains the connection between Atlantis and Antarctica or more simply, that Aztlan might actually be Atlantis, the legendary place on the south. The devastating events that happened in Aztlan (or Atlantis) left only a few survivors who migrated to different continents and blended with the others. Doubters tend to reject the theories that associate Atlantis and Antarctica, mainly because Antarctica today illustrates an icy ambiance and no human civilization. Despite the scepticism, old artefacts prove that Antarctica was a place full with vegetation and courtesy. Examples of those artefacts are the ancient maps that paint America with no ice – zones. The most eminent one is the Piri – Reis map created by an admiral who served in the Navy of the Ancient Ottoman Empire. The Piri – Reis map was established with the help of other, older maps which sketch the shoreline of Antarctica but not as we see it today, they sketch it free of ice. This confirms that whoever explored Antarctica and depicted it on the maps was doing that when the continent wasn’t frigid. The question that pops now is how a continent with a location to the south could ever be free of ice? The response is that Antarctica wasn’t always occupying the South Pole and was rather between it and the Equator meaning it was based north and seasoned tropical climate and grew forests. Yes, Antarctica in the early history was a place that was home to many people who progressed into societies just like the other fellow continents. The theory that justifies these allegations is called crustal displacement. The dominant belief between the traditional scientists is the belief of continental drift. According to this theory, our planet’s layer is branched into tectonic plates that float over the inner layer. With the time passing by, these plates slowly bounce against one another. The other, revolutionary theory, the theory of crustal displacement, enlarges the traditional history. This theory claims that every 40,000 years, the entire crust of our planet fluctuates as a single entity. After each fluctuation all the land masses on our planet, continents included, are dislocated to their new planet position. Many researchers apply this is exactly what moved Antarctica from its position in the middle of the South Pole and the Equator to the top of the South Pole. In the present, Antarctica is built from a kilometre thick ice that consists 98 percent of its property. That means that all of the ancestry the ancient civilization made in the time Antarctica was “a green continent” is now entombed underneath the massive ice. In 1949, Admiral Baird’s exploration drilled holes into the Ross Sea in three spots, where Orontius Finaeus sealed river – beds. At the end there were found fine – grained layers probably brought to the sea with the help of the rivers whose origins were located in zones free of glaciers. The samples were taken from three distinct locations: 70 deg. 17’ S 179 deg. 15’ W 2,990 M deep, 69 deg. 12’ S 180 deg. S. at 3,130 M. deep, 68 deg. 26’ S 179 deg. 15’W at 3,292 M. deep. The fine – grained debris that was found is from the same kind as the one carried by rivers from non icy continents. Moreover, his expedition brought valuable data of fossils on Mount Weaver. In 1952 the geologists found two species of a tree plant referred as Glossopteris that was regularly seen on the continents as Africa and Australia. Core fragments taken from the Ross Sea during the excursion suggest glacial marine sediment from the present first appeared nearly 6,000 years ago. In addition to that, there is a zone fine – grained sediment 30,000 years old which proves this continent was definitely not icy as it is now. All these evidences tend to make us believe that between the 4th and 12th millennium before Christ, the Earth was housing extremely smart civilization with fascinating intellect of cartography, astronomy and other branches. They were much more advanced than their followers. The modern civilization was a precedent to the long lost civilization called Atlantis and the evidence is hidden the thick ice of Antarctica, theorists claim.